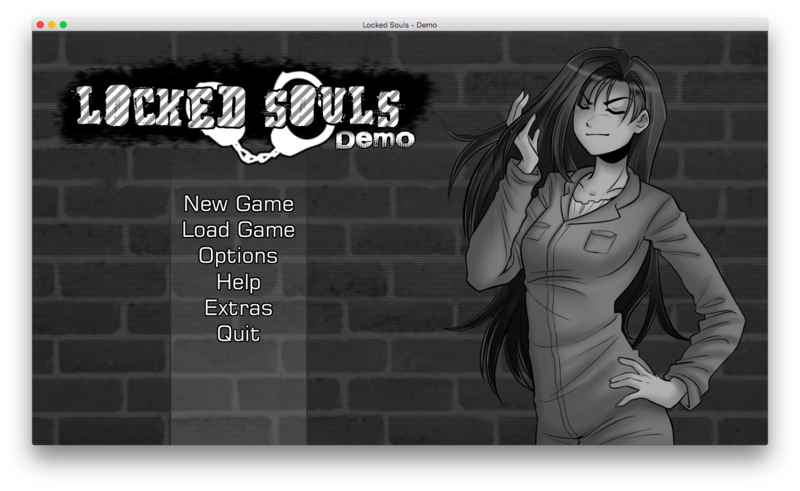 I'll be posting all the reviews in my drafts folder one by one, so... let's start with this demo, haha. I played this game like, last July, I think? But I never got around to posting a review, haha. It's obviously loooong overdue, so... here goes! The demo starts on your first day of work as a male guard in an all-female prison. Another guard, May, gives you a tour around the place. On your first night, however, you find yourself in an unexpected and potentially dangerous situation concerning four other inmates in the prison. Will you be able to survive your new job? Okay, I have to be honest, I only checked out this game because it’s set in a prison, which I, as someone who has read too many crime fictions, found really interesting. 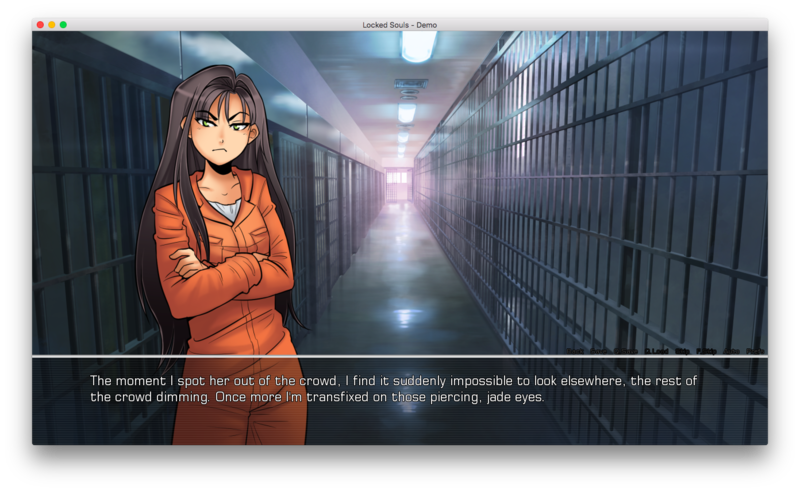 Plus, it’s not a common setting in visual novels, you know? I was sort of disappointed when I found out that it was a BxG game, since I really prefer GxB, but I still decided to give it a try. And what do you know, I wasn’t disappointed. At all. Luke is the protagonist of this story. He’s the new guard in this all-female prison, though he was apparently unaware of that fact when he was applying for this job. Basically, he was just looking for something, anything, because he needed the money. He’s not particularly nice nor is he particularly smart, but he is particularly wimpy. Yep. He keeps giving in to the girls’ demands, letting them step all over him. It’s actually both frustrating and irritating to watch him get trampled on by the prisoners all the time, all because he’s letting them do it. Sheesh. It makes me wonder, how did this guy ever get the job?! She’s a female guard who has been working in the prison for about a year. She is also, as Luke describes her, a minx of a girl. That’s because May can be pretty flirtatious at times, though it’s not really obvious. She also sometimes mistakes Luke to be flirting with her. It seems to me that she likes teasing him a lot too, and watching him squirm under her relentless teasing. Her. She’s the first inmate that caught Luke’s eye, though May did warn him about her. In his own words, Katherine “almost [has] an air of superiority about her, that distinguishes her above everyone else.” Luke seems to be absolutely attracted to her, right from the very start. Despite what the in-game descriptions of her may be, though, I don’t really find her that pretty. Her eyes look way too evil, I think! However, I do love her voice acting, which has a seductive, almost sultry sound to it. Her name is Katherine. She sounds like one of my best friends, a real-life Katherine with the same piercing eyes. A supposed mass murderer. She seems rather frail and fragile though, always just sitting quietly by herself and reading a book. She speaks in an odd, broken manner that seems almost child-like. Luke finds it hard to talk to her, as it’s not that easy to comprehend what she’s saying when she’s speaking in such broken fragments. Nevertheless, she’s my second favorite character, after Ms. Sleepyhead. Her name is Lisa. Her personality is as fiery as her fiery-red hair. On Luke’s first day on the job, she almost manages to strangle another inmate while they were playing basketball. She seems to get a lot of time in solitary confinement, probably due to her personality. Of all the girls, though, she seems to be the friendliest, albeit she can be too friendly. She can also be quite a teaser sometimes, which kinda annoys me, because it magnifies Luke’s wimpiness even more. Ugh. Hahaha. Her name is Rachel. Always the sleepy and ditzy one. This girl confuses me, because I both find myself drawn to her and yet irritated by her. Her way of speaking annoys me because she speaks so… painfully… slow… and in broken sentences too, yet at the same time, her clumsy personality is just so adorable. I’m actually torn between her and Lisa! Then again, I think I’ll go after all of them anyway. Hahaha. Her name is Emma. The writing here is good! There were no glaring errors, though I did notice a few typos and spelling mistakes. One thing I noticed was that the farther I got in the game, the more I saw spelling mistakes. Maybe that’s because the later parts haven’t been beta-tested yet? Maybe. But I love how the writing managed to strike a balance between dialogue and descriptions! I don’t like super descriptive writing, but at the same time, I like having descriptions in between dialogues too, as opposed to just pure dialogue. 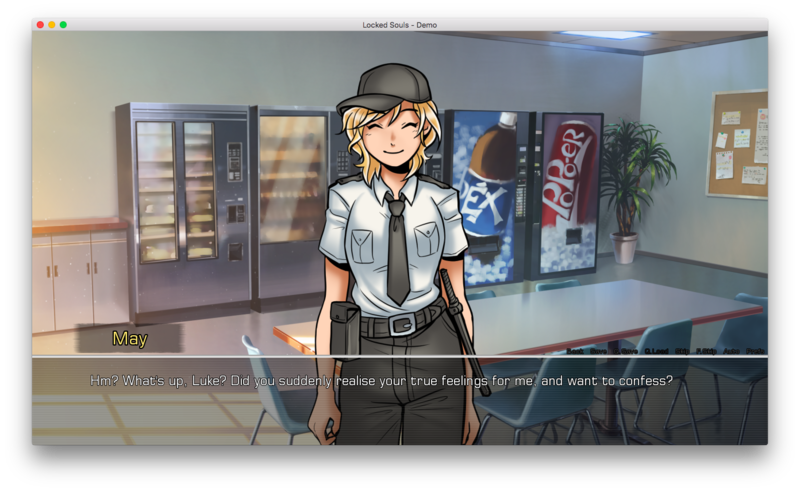 This visual novel managed to hit that sweet spot, in my opinion. The art is good. I like how the sprites have solid black lines, and I also like the coloring style. The characters also have a couple of poses each, around 2 or 3 or even 4 maybe, apart from all the expressions. It makes them look really lively. I don’t know a lot of visual novels that make use of multiple poses since creating and scripting all those sprites take a lot of time, so I really appreciated them in this game. The backgrounds are pretty good too. However, when you look closely, you’ll see that they look like a cross between hand-drawn images and filtered photographs. I’m pretty certain they’re not the latter, though. But anyway, they all match each other really well, so that’s a plus. The GUI is customized, but it’s a very simple, minimalistic style. 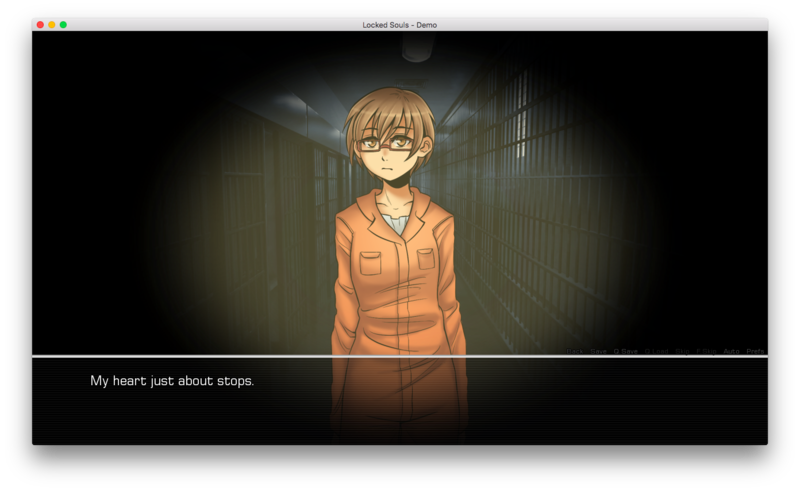 While it does complement the “prison” theme of the game, I sort of dislike the fact that it has no buttons at all. No buttons! Where’s my auto-read option? For some of you who have seen my other reviews, you’ll know that I really like setting a VN on auto-read, so that I wouldn’t have to press anything anymore. Nevertheless, the lack of buttons won’t bother you anyway if you’ve never used them, so… I guess that all depends on your personal preference. The music here is subtle, obviously meant to be background music. However, I couldn’t help but notice every time the tracks looped, because they had a fade out (or perhaps fade in?) effect. I gotta agree with you there, darling. 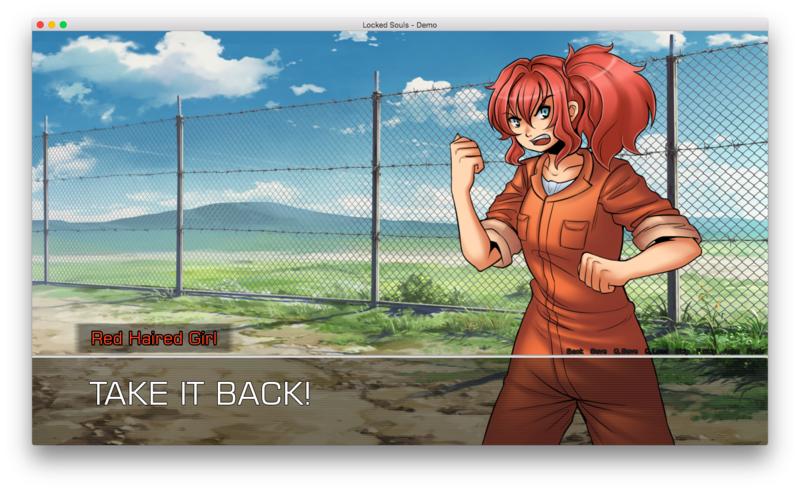 Oh, by the way, there’s voice acting in this visual novel! Hooray. I’m not a huge fan of voice acting, (since I’m a pretty quick reader who, most of the time, finishes reading quicker than a character can say the whole line) but they are always a welcome addition to any game. In here, the voice acting was excellent, if not a bit too soft at times. My favorite was May’s VA! Her character’s really energetic and always so pumped-up, and I’m glad to see that her VA did her character justice. She actually reminds me of Blossom’s voice actress from The Powerpuff Girls. Hahaha, oh, sweet nostalgia. (Note: TPG was a huge part of my childhood, alongside Baby Looney Tunes, Disney Princesses, Pokemon, Meitantei Conan, and Inuyasha!) My second favorite is Long-haired Girl’s VA. She’s really, really good! I’m a little bit disappointed that Luke doesn’t have a voice-actor, though. That would’ve been fun! Heh, fun. Fun. 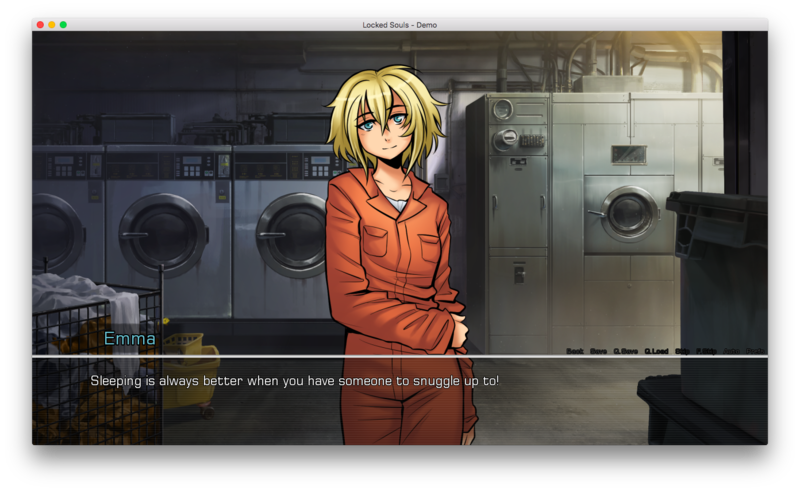 I greatly enjoyed playing this visual novel! I’m almost sad that all I have is a demo and not a full version. I wonder when the full version will come out? When it does get released, I’m pretty sure I’ll be doing all the routes! That’s pretty rare for me to do, especially considering the fact that this is a BxG game and not my usual otome game, but the characters here are just so interesting that I couldn’t possibly resist! Yes, my dear Katherine, I’m ready to have some fun! You can download this demo here. For updates, you can also check out this LSF link.